PDF file format has a feature that supports passwords to protect PDF files. PDF supports two kinds of passwords, the user password and the owner password. If you need to unlock some protected PDF files for easy sharing, you can use PDF File Unlocker for Mac OS X. A user password is used to encrypt a PDF file and prevent opening the file. Anyone or any application that does not have the correct user password will not be able to open the PDF file. Presently, an enough complex password can make the PDF file absolutely secure. An owner password is to restrict some operations to the PDF file. For example, the owner of the PDF file can restrict editing, copying content, modifying and commenting operations to the PDF with an owner password. If you are the owner of the PDF file but forget the owner password, you can easily remove the owner password using PDF File Unlocker for Mac OS X. If a PDF file has been protected by a user password and an owner password, with knowing any one of the two, PDF File Unlocker for Mac OS X can instantly remove the two passwords. The operations to unlock password protected PDF files are easy. You can see the main interface of PDF File Unlocker for Mac OS X in Figure 1. Click button Add File, and select the PDF files into the file list. Choose an Output Folder to save the new unlocked PDF files. Click Start to start the unlocking process. When come to a PDF file locked by user password or both user and owner password, you should input the one correct password of them to unlock the PDF file. 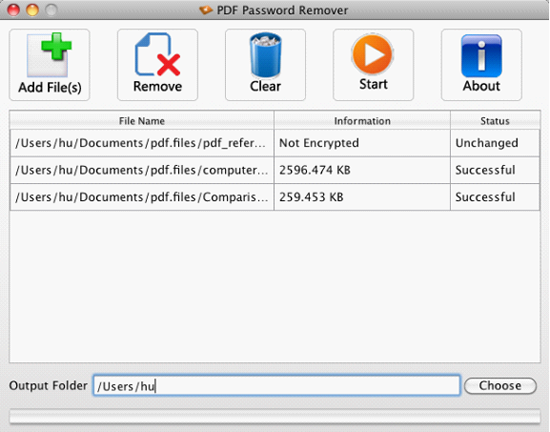 If you want to unlock PDF files locked only by owner password, PDF File Unlocker for Mac OS X can help you. If your PDF files are locked by owner password and user password, PDF File Unlocker for Mac OS X can help you with unlocking the PDF file in the condition that you have one of the two passwords. Click the following link to view the features of PDF File Unlocker for Mac OS X.